A new study by an international team of scientists, led by Stefan Kraus from the University of Exeter, has given a fascinating new insight into one of the most respected theories of how planets are formed. Young stars start out with a massive disk of gas and dust that over time, astronomers think, either diffuses away or coalesces into planets and asteroids. In the new research, the team use high powered telescopes to target the star V1247 Orionis -, a young, hot star surrounded by a dynamic ring of gas and dust. The team produced a detailed image of the star and its surrounding dust disc, shown in two parts: a clearly defined central ring of matter and a more delicate crescent structure located further out. The region between the ring and crescent, visible as a dark strip, is thought to be caused by a young planet carving its way through the disc. As the planet moves around in its orbit, its motion creates areas of high pressure on either side of its path, similar to how a ship creates bow waves as it cuts through water. These areas of high pressure could become protective barriers around sites of planet formation; dust particles are trapped within them for millions of years, allowing them the time and space to clump together and grow. Professor Kraus said: “The exquisite resolution of ALMA allowed us to study the intricate structure of such a dust-trapping vortex for the first time. The crescent in the image constitutes a dust trap that formed at the outer edge of the dark strip. 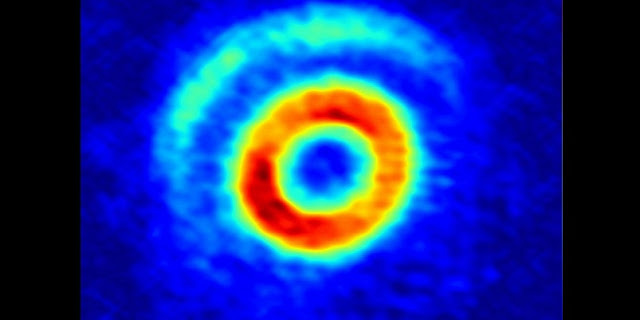 “It also reveals regions of excess dust within the ring, possibly indicating a second dust trap that formed inside of the putative planet’s orbit. This confirms earlier computer simulations that predicted that dust traps should form both at the outer edge and inner edge of disc gaps. Dust-trapping vortices and a potentially planet-triggered spiral wake in the pre-transitional disk of V1247 Orionis is published in Astrophysical Journal Letters. There are still many things to learn and explore in the space. Thank you for sharing the post.